22' Anti Glare Touch Screen Black and White, Color, Sketch, Painting, Sepia and more print choices. Video recording of messages and video images! Canon Digital DSLR Camera - the NEW CANON T5i. Green Screen and Video options! Road Tough Road Case Design - built to last! Internal LED maintenance lighting so your not fumbling around in the dark. Fully integrated CPU Unit Air Cooled - 1.8ghz dual core, 4 GB DDR ram, 500 GB hard Drive. No loose cables or flimsy cheap laptops installed here - all wiring and circuitry is fully hard wired into the booth. 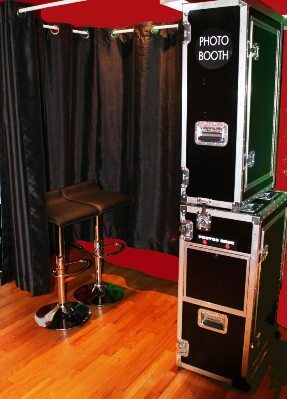 ONE switch and the booth boots up - everything starts at the flick of ONE switch only! Height of each case is 36"
Width of each case is 23"
Depth of top case is 11 1/2"
Depth of bottom case is 15 1/2"
When you lock both together the become one case with tip wheels and measure Height: 36" Width: 23" and Depth: 27"
Rental Price: Contact 802-839-0149 for 3 hour party with unlimited pictures.